I saw some dried wild blueberries at the organic shop this week, I thought that was such a good idea - a great addition to the world of dried fruits. I do not often buy dried fruit, except for raisins for the bircher. So I ended up with some dried blueberries and no idea what I was going to do with them. Not such a rare occurance, returning from the shop with a new and interesting ingredient with the hope that it will inspire me before it goes off. And what else do you make with dried fruit at this time of year but hot cross buns? This year they are going to be dried wild blueberry hot cross buns. Put the milk, butter, zest, cloves and cardomom in a pan and bring to a simmer then turn off the heat and leave to infuse for 30 minutes. Remove the cardomom and cloves and beat in the egg. Mix the flour, spice, yeast and blueberries together then make a dough using the milk and egg mixture. Knead until the dough is as smooth as a dried fruit filled dough can be. Put in a greased bowl, cover with plastic and leave to rise for 1 1/2 hours or until doubled. Shape into buns and cut a shallow cross in the top and leave to rise again for 30 minutes. Make a paste for the crosses with the flour and sugar and enough water to make a stiff, but pourable mixture. When the buns have risen, paint with the egg wash and spread the paste in the cross marks. Bake for 20 minutes at 210°c. Make a glaze by mixing the sugar with the same amount of boiling water. 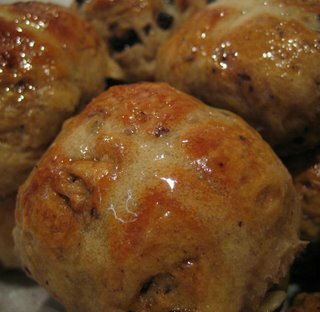 As soon as the buns come out of the oven paint them with the glaze. Thanks Ange - they really were!